Among sushi terms, there is a word called “Fucho” which is unfamiliar even to Japanese. It would be cool if you knew, but it wouldn’t be embarrassing even if you didn’t. However, these terms are used between pros. It seems senseless if customers use them and sushi chefs might find it off-putting. Why is sushi served with Gari? This ginger includes Zingerone, a pungent component, and Gingerol, a spice component that changes to Shogaol when heated. Zingerone and Shogaol combine with the components that cause the fishy smell of fish and can eliminate that smell from its source. It makes sense to use ginger as a condiment for fish known for a stronger smell, like horse mackerel and bonito. The Gari served with sushi utilizes the effects of these components effectively for enjoyment of the delicious taste of the sushi. On the other hand, wasabi works by numbing senses of taste and smell with a stimulating spice so that the consumer doesn’t experience the fishy smell. Furthermore, when you try to eat a light sushi topping after a strong one, a bit of Gari will cleanse your palette so you can fully enjoy the lighter fish. The pungent component also accelerates saliva production, assists with digestion and enhances absorption. 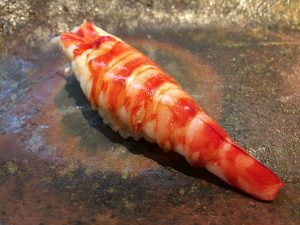 Posted on June 26, 2017 September 12, 2018 Categories Basic KnowledgeTags Gari, Nigiri sushi, Sushi GlossaryLeave a comment on Why is sushi served with Gari? 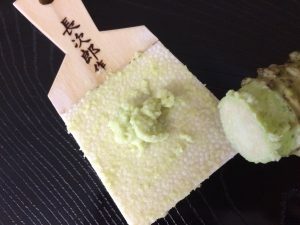 Back before there were refrigerators, wasabi was indispensable for Nigirizushi, eliminating the fishy smell and also providing bactericidal effects to prevent the fish from spoiling. Wasabi is originally from Japan and it has been used in Edo-style sushi from the very beginning. 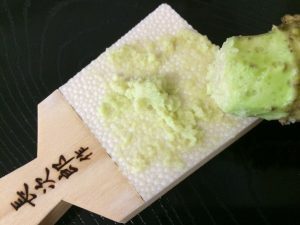 Even with all the advancements in technology for storing sushi toppings, wasabi is still used today to remove the fishy smell and prevent spoiling. However, nowadays the flavor and aroma of wasabi and the way it brings out the flavor of the sushi topping is the main focus. When wasabi is grated and exposed to the air, its unique heat is made enhanced by enzymes. Using a coarse grater gives the wasabi a rough, fibrous texture that spreads the spicy flavor through to the back of the throat. On the other hand, if Sharkskin wasabi is grated finely, it foams up with tiny bubbles and makes a creamy taste. The type of wasabi depends on the personality of the shop. 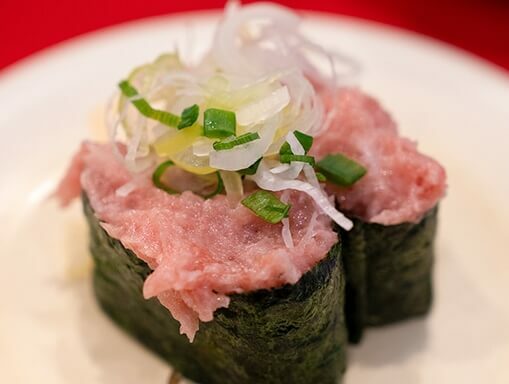 However, the powdered wasabi and wasabi paste you find at kaiten-zushi (conveyor belt sushi) is primarily made from horseradish and is colored and scented with additives. It isn’t dried wasabi and it is significantly cheaper. Among Sushi Glossary (sushi terms), there is a word called “Fucho” which is unfamiliar even to Japanese. It would be cool if you knew, but it wouldn’t be embarrassing even if you didn’t. However, these terms are used between pros. It seems senseless if customers use them and sushi chefs might find it off-putting. *Japanese terms will be italicized on sushi glossary page. Aburi－To bring out the deliciousness by searing the skin and melting the fat. Used on a type of fish with fat between its skin and meat. Agari－A Japanese sushibar term for green tea. A term for green tea at a Japanese sushi bar, which helps freshen the mouth by washing away any fatty taste. Akazu－Red vinegar made from sake lees, characterized by a strong flavor, slight sweetness and its reddish color. Akami－Lean tuna, cut from the back of the fish. See also Maguro. Aniki－Things that are older. Food ingredients that need to be used earlier. The opposite of this word is “Otouto”. 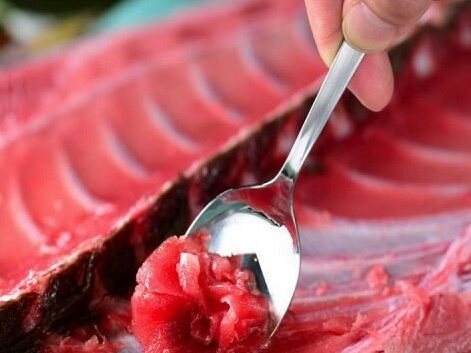 Astaxanthin－A red-colored component found in organisms such as salmon, shrimp, and crab. It has been drawing an attention for having an excellent anti oxidative effect and oxidation prevention. Bachimono－Wasabi (Japanese horseradish) other than the ones from Izu Amagi, which is called “Honbamono“. Donshari－Regular rice that is not vinegared. Dress－Fish, whose head and internal organs have been removed. Edomae－Edomae means sushi using fish from the sea that lies before the Edo town. Although the fishes caught only in Tokyo Bay are not enough to feed numerous sushi lovers. 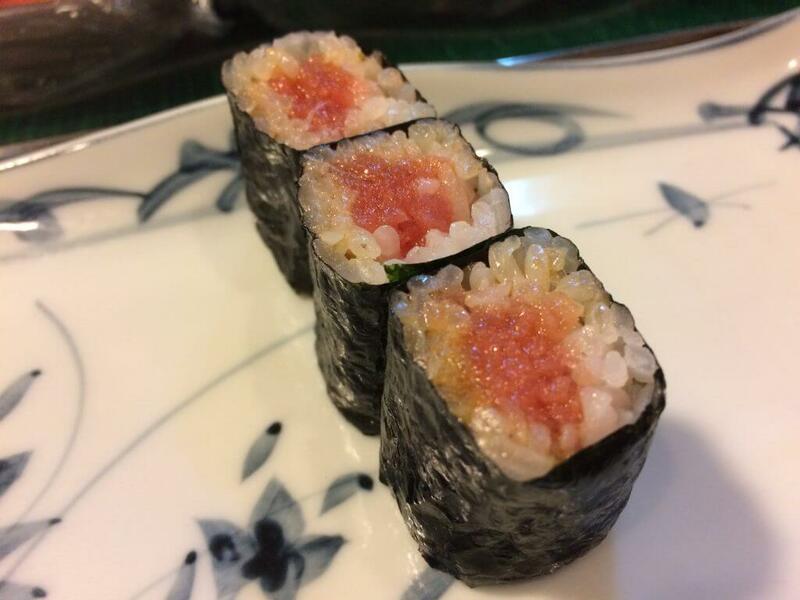 The excellent work of Edomae sushi chef in which the ingredients are vinegared or seasoned with soy sauce after salted, a common method for longer preservation. Furijio－To sprinkle salt lightly all over an ingredient. Causing an effect of making it salted, extracting moisture, and tightening its texture. Gari－A sushi-bar term for pickled ginger. Pickled ginger that helps cleanse the palate after eating fatty sushi like Ohtoro. Gezakana －Relatively low-cost sushi ingredients, such as gizzard shad and horse mackerel. Bluefin tuna used to be also called gezakana in the Edo period, for losing its freshness easily. Gunkanmaki－Sushi made by wrapping dried seaweed around vinegared rice, topped with salmon roe and sea urchin which is easy to crumble on top. Haneru－To throw away a part of something or the whole thing that cannot be used for ingredients. Haran (Baran)－Plant leaves used as dividers and decorations when sushi is served. Mostly bamboo leaves in the Kanto region. Ikejime－A process of cutting the medulla oblongata off of live fish, removing the nerves and draining the blood. Inrouzume－A small boiled squid stuffed with sushi rice, Kanpyou, chopped Shiitake mushrooms, Oboro, and etc. Irizake－A traditional Japanese seasoning made by boiling down Japanese sake with pickled plums etc. Jukusei－Maturing. By preserving fish in refrigerator with adequate water content and temperature, the umami taste will be condensed. The maturing period is usually a couple of days, sometimes it lasts for weeks. Katamiduke－Using one side of a fish’s body to make sushi. 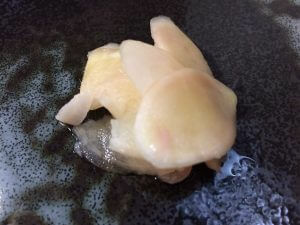 Kataomoi－One-sided love:Abalone, for having a shell on only one side of its body. Kazari boucho－Small cuts onto the ingredients in order to make it look beautiful. Kakushi boucho－Make slits onto the firm ingredients in order to make it easier to bite. Kiritsuke－To cut fish for sushi topping shapes after slicing into three fillets and taking off skin, bones and such. Kobujime－The fish ingredients marinated between sheets of kelp and then let sit overnight in the refrigerator. Konawasabi－Powdered horseradish (a.k.a. wasabi daikon), which is reasonable but has a weak flavor. Kusa (Nori)－Purple layer seaweed pressed into thin sheets. It is essential for sushi roll and Gunkanmaki. High-quality one is flavorful, shiny, and has a smooth texture. Maruduke－Making sushi with one whole fish. Meji－Young bluefin tuna (Maguro) which weighs about 10 to 20kg. Mugiwaradai－Red seabream (Tai) caught during the time of the barley harvest (early summer) is skinny after laying eggs and doesn’t taste good. Murasaki－Sushi bar term for soy sauce. Nakaochi－The middle bone part when fish is cut into three fillets. Or the meat attached to this part. Used especially for tuna, becoming ingredients for tekkamaki, negi toro and etc. Namida (Sabi)－Wasabi has a pungent taste which removes fishy smell from the ingredient, thus the fish becomes tastier many times as much. 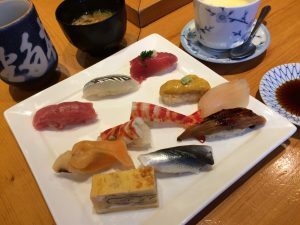 Neta (Tane, Sushidane)－Sushi bar term for the fish topping in nigiri sushi. Nikiri (NikiriShouyu)－Nikiri is a short form of nikiri syouyu in which an alcohol-evaporated Mirin, Sake, Soy sauce and Dashi broth are added together. Oaiso－To get a check and make a payment by customers at a sushi restaurant and elsewhere. Obitsuke（Noriobi）－To bind toppings to sushi rice, such as white fish and egg, with seaweed like a belt (obi) for a kimono. Oboro－Usually, salt, sugar and Mirin are added to mashed shrimp meat, and then roasted in a pan until they are smaller flakes. Odori－Serving sushi made with live seafood such as prawns. Okimari－The price and menu content are easily understood when ordering “Okimari”. The rank of “Tokujou”, “Jou”, “Nami” are often used. Order additional sushi as you like for a more fulfilling experience. Okonomi－A way customers choose and order sushi they want to eat. If you clearly know what you like and want to enjoy eating at your own pace, ordering “Okonomi” your choice of sushi, would be best. Omakase－A way customers choose and order sushi they want to eat. If you do not have likes or dislikes and would like to enjoy the delicious catch of the day, “Omakase” is the way to go. Otachi－To have a seat at the counter and eat by ordering okonomi. Otouto－Food ingredients that are used later. Sakuradai－While cherry blossoms are in bloom, Red seabream (Tai) comes into season and increases its deliciousness. Shari (Sumeshi)－Cooked rice mixed with sweet sushi-vinegar in which sugar and salt are added. In sushi term it is called “Shari”. Shirozu (Komezu)－White vinegar made from rice, characterized by smooth and refreshing sour taste. Sotoko－Eggs of shrimps and crabs, folded and protected in their parents’ legs after being laid. Shigoto－Refer to carrying out an extra preparatory step for edomaezushi toppings, such as brushing with Nitsume, or steeping fish in vinegar. Tatejio－Salt water which is around 3 percent salt about the same as seawater, usually used for preparing thin body fish and seafood before cooking. Soak fish in tate jio and make it salted evenly because sprinkling salt can make it too salty for thin body fish by furi jio. 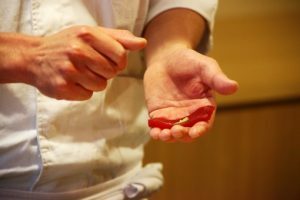 Tezu－Vinegar that is put on fingertips of sushi chefs when they make sushi, to prevent sushi rice from sticking to their fingers. Tsume (Nitsume)－Short form of Nitsume. Soy sauce, Mirin and sake are added to the soup in which Anago eel was boiled, and then boiled down until it gets thick sweet. Tukeba－An area where sushi is made. Tuma－Daikon radish which is thinly peeled and shredded. Uramaki－A rolling technic of putting sushi rice on the outside, and seaweed on the inside. Uchiko－Eggs inside of shells before being laid, such as shrimps and crabs. Yakishimozukuri－A cooking method of grilling fish fillet with a little bit of skin left, over high heat for a short time and cooling it down. Its purpose is transferring the roasted skin fat into the meat. 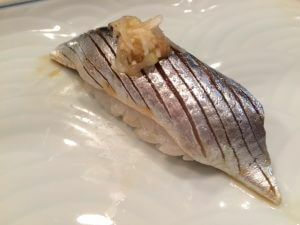 Used mainly for fish with thick and hard skin, like Mackerel (Saba) and Chicken grunt (Isaki). Yama－Bamboo leaves used for a decoration. Called yama (mountain) because they are gathered only on mountains. Yuburi－A process to cook just on the surface such as meat and fish,which is dipped in boiling water and shaken quickly. 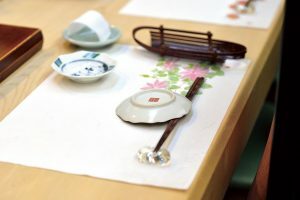 Zuke –Seasoning method of fish such as Maguro tuna in dashi joyu, which was developed in the late Edo period in order to preserve fish longer.